How to spend your daylight savings. Last month’s “spring forward” to Daylight Saving Time may have cost us a little sleep, but now we get to reap the rewards—outings that can stretch luxuriously into the evening, thanks to that inviting extra hour of sunlight. Now that longer days are officially here, it’s time to get out and enjoy some of the city’s seemingly infinite supply of springtime activities. Here are a few favorites for this month, hand-picked for our Stepping Stone friends. Hope springs eternal for Denver’s beloved, if beleaguered, professional baseball team. Support our boys by attending the always-exciting opening day game, this year against the San Diego Padres. The game, the beer, hot dogs, and Dinger are attractions enough, but more serious fans will be interested to see the effect of the newly raised outfield wall. What will this do to our high-altitude home run advantage? Tickets $40-250. Learn more. Remember the Academy Award-winning 2007 movie with Johnny Depp? This darkly funny thriller by Stephen Sondheim veers off in a bold new “gypsy punk” musical direction, reinvented by DeVotchKa, Denver’s Grammy-nominated hometown heroes. The story centers on Sweeney Todd, an unjustly treated London barber who exacts revenge by slicing his way through the city’s upper crust. (Actually hilarious, but not for kids or the squeamish.) Performed at the DCPA’s Stage Theater. Tickets start at $35. Learn more. In Denver, Elitch’s and summer go hand in hand. But why not be a contrarian and visit in the spring? Your reward will be smaller crowds and better temperatures. Beyond the park’s impressive 53 rides and attractions, this year’s extras include exciting new family shows, Dive-In Movies, a free summer concert series, and three fireworks extravaganzas sure to light up the Denver skyline. Tickets range from $29.99-49.99, but children aged 0-3 are free. Season passes are $69.99. Learn more. Free seedling trees are your parting gifts from this year’s Arbor Day celebration—as well as a belly full of delicious pancakes. Join the Town of Parker (proud to be a Tree City USA) and the Parks and Recreation Department at Salisbury Park for this free, annual celebration of trees. No planting trees at the event this year, since the town’s parks are beautifully complete, but arborists will be on hand to answer your questions about planting, pruning, and selection. Kids can also build and take home a bird house, courtesy of Home Depot. And the day will include a new 5 Mile Run/Walk too (registration is required). 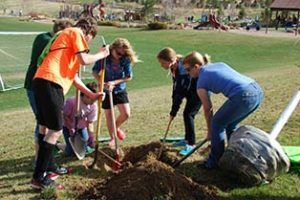 Learn more about Arbor Day Celebration here.